A collaboration between scientists from the School of Physics and the Advanced Institute of Industrial Science and Technology (AIST) in Japan has achieved a breakthrough for enabling faster, more compact and cost-efficient telecommunications using advanced optical frequency comb technology. This was presented as a prestigious postdeadline paper at the Optoelectronics and Communications Conference (OECC/PS) in Niigata, Japan in July. 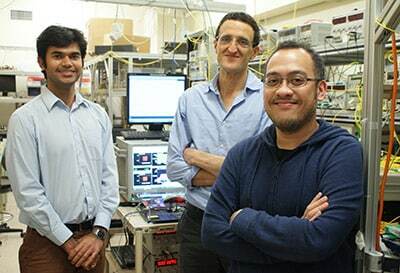 The project, led by Dr. Mark Pelusi, Dr. Amol Choudhary and Dr. David Marpaung in the School of Physics, has been investigating the use of optical frequency comb technology (a discovery that earned earlier researchers a Nobel Prize in 2005) as a means for replacing an array of sophisticated lasers currently used in telecommunications at a fraction of the cost, weight and size. A major hurdle, so far, is that state-of-the-arts frequency combs were underperforming due to high noise - a problem that has now been overcome. "We have developed a unique spectral filtering technology that can get rid of the deficiencies in the comb using the interaction of light and sound in an optical fibre known as stimulated Brillouin scattering (SBS)," said Dr Mark Pelusi, the lead author of the paper. "Until now, SBS is widely regarded as a nuisance in long-haul transmission and is viewed to be a very noisy process, which has been deemed to be incompatible with high-capacity optical communications. Our results challenge this long-held belief in the scientific community. We harness the SBS process in an optical fibre to essentially clean-up the frequency comb using the comb itself." Dr Amol Choudhary also added that their research revealed a dramatic improvement in performance over a very large range of frequencies. "We can simultaneously put data on multiple comb lines and our technology is also scalable, thus opening the path towards the realisation of a high-performance frequency comb with 100s of lines which can be modulated with high data-rates," he said. "This simple and robust technology could be used to clean-up combs for a variety of applications and can have near-time commercial applications in the telecommunications industry", added Dr. David Marpaung. The team working in the ARC Centre for Ultrahigh bandwidth Devices for Optical Systems (CUDOS) in the School of Physics, said the long-term collaboration with the National Institute of Advanced Industrial Science and Technology in Japan, fostered through recent mutual lab visits, supported by the Australian Academy of Science, and the University of Sydney International Research Collaboration Award (IRCA) program, was crucial to this breakthrough , and that even higher speeds approaching hundred Terabits per second could be reached in the near future. Drs Mark Pelusi and Amol Choudhary are both available for interviews regarding this breakthrough in telecommunications through our media contact below.